CHA was a blast yesterday! I carpooled with Tam from SCS and it was really nice getting to know her better! CHA is a little different from the trade show- Ranger was not there- so no Tim Holtz….. but there was alot to do and I ran into lots of people- including Beate from SCS, Chrissy D and believe it or not, a lady I met is a stamp store in Kentucky in the past…..we both looked at each other and asked- “how do I know you…..” ? It really is a small world! SO many familiar faces! I completely forgot to take any pictures though……. I signed up to be in a ‘mystery’ FOCUS group- I rec’d an e-mail asking me to participate after signing up for CHA- and I decided it is really important for manufacturers to have feedback, so I signed up. The group I was in was feedback about packaging for Martha Stewart products for gift boxes. It lasted an hour- and after the hour was over, we were presented with this gift……. Then I hit the floor and went to town! I usually do not do make and takes until I am able to shop the entire floor, and I usually do not buy alot until I see who has what and check the prices. Not alot was on sale, but to not have to pay shipping and handling….! I was able to make it all the way through Cha and then went back and did a few make and takes. Thanks for stopping by Today-Have a great weekend! I finally have time to sit and stamp AND have POWER (We keep loosing power on/off). Yeah! This is done using a new technique called Soft and Sparkly –yep it is! Sorry- this is fuzzy- best sparkley picture I could get- and just a note- the cardstock is by Paper Temptress - heavenly with the Copics- and it is sparkly to start with! The sparkle comes right through the Copic color! The image was colored with Copics C2, Rvoo, Rv32, RV34, G1, G24. Punches by SU, Flower Soft from Firecracker Designs by Pamela. The buttons (in the shape of cheese) were made for the Crafters Digital Art Center Embellishment Challenge-just started today (and is hosted by D2D this week). If you have a minute or two, stop by the Creative Inspiration Paint Blog- Jungle Fever today and all DT samples in one place! You'll love them! The Technique Junkies has a perpetual ATC swap- any time I make a set of ATC’s, I mail them to Juliet, our swap hostess and I receive as many back as I send. Well, today in the mail, I received quite a few ATC’s in return. The ATC’s we trade focus on a technique from any newsletter published by Technique Junkies- a great way to get samples of many different techniques and other stampers art! And they are all so much better IRL!!! Here is the Technique Junkies web site if you are interested. Nothing I made here- I should have another technique ATC swap in the mail soon! I was a touch under the weather today- will work tomorrow….hope to stamp Thursday! There are just a couple more Wacky Wednesdays at FCD- and you still have time for Christmas in July!!! This week, the stamp set that is 50% off is Oh Holey Night-no coupon required-good through 11:59pm Wednesday only! Here is a card and a Template by Hetty (LOVE this!!! ), Here is a sample by Boni, HERE is the gallery on the FCD website with samples for your viewing pleasure! PLUS, check out the SALE section at FCD for more Christmas sets marked up to 25% off. Share your artwork with us! There is a gallery for Fans and we’d love to see what you make!!! It is so hard to photograph the incredible shimmer of these paints!!! I took a small piece of Saran wrap crumpled up and touched it to the lid of Sky Blue, and dabbed on the BG…then I added a touch of Aqua Marine for highlights. This took less than three minutes….. HERE is the link to the Creative Inspirations Paints website that shows all of the available colors. If you already have some, please use Mr Linky on the CI paints blog HERE- we’d LOVE to see any projects you have made with the paints. (See Mr Linky up in the top right?). HERE is the link to see what the rest of Design Team A has made with this theme- there are only four of us, and all of the posts are in the same place- please stop by! 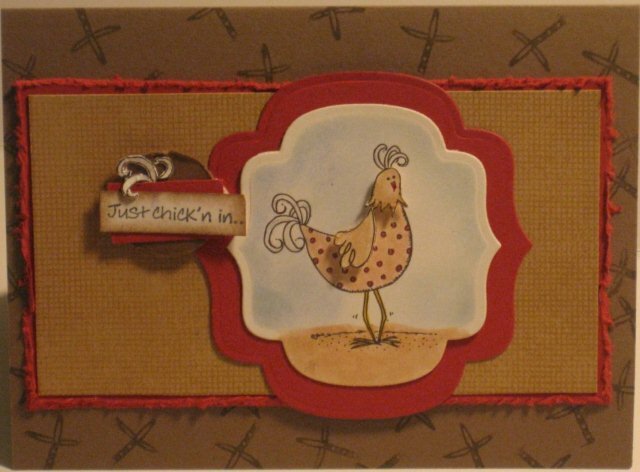 So, I went through all of the possibilities for a moving card- I found a kit of Creative Cuts and More cardstock and cards and die cute that I won in a blog candy over a year ago….and found a ‘flip-flop’ card (is there another name for these?) . I have stamps by Artistic Outpost that I am wanting to ink up and then I came across some DSP from the Tim Holtz idea-ology collection and just had to use it. I made this card for a dear sweet woman who is having a really hard time in her life- the sentiment says it all, doesn’t it? The image of the bird is by Memory Box and is embossed with Black EP and colored in with Creative Inspirations paints. The bird was first colored with Copics C3,C5,and C7 and painted over with Angel Dust (see how you can still see the blending right through the paint?). I used Olive Green and Choc Chip for the branch. Dew drops finish the card-three top right and three bottom Lt.
(The Dew Drops I found about 2 years ago on E-bay HERE and still have plenty in many colors). Hope to see your sketch card plus something that moves- you have two weeks to play- we’d love to see what you create! If you need more inspiration, stop by the other Belli designers- links in my sidebar to the right. By the way....HERE is a link to the Artistic Outpost Blog- did you know if you make a card with one of their images and post it to their blog, you have a chance to win a free stamp set? I won in May- how fun- and they have wonderful stamps! It’s Christmas in July at FCD and Pamela has the set Snowlady Wreath 50% off Wednesday only (That’s $4.49 today only- no coupon required). Boni has made this darling card –isn’t it fun? 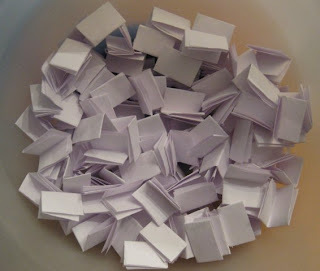 Luckily, I saved the bowl with all of the slips of paper from my blog candy- I had three winners that did not claim a prize within 48 hours. For Bloggers Challenge this week, Group Mom Lisa challenged us to a Sketch Challenge- I love trying out new layouts so I used the layout on my weekly D2D card. I used the darling chicken from D2D for this week for the challenge. My Mom grew up on a farm, and we always thought we were so special when Grandma chose us to help her get the eggs for the day! At D2D or Designed2Delight, you get a free digital image the first week of each month, and if you post a card, you get the next weeks image free. (The image is available in her store if you wanted to jump in…..) I think it is a great way to see if you like digital images AND if you ever think you may like to be on a design team, it is a great way to see if you can meet a deadline of posting a weekly card and making comments on other players cards. I colored the image with Copics and added Spica Red to the dots, and clear Spica marker to the feathers to make her glisten. Sentiment is from Clear Dollar Stamps Thoughtful Notes. I popped up the head and feathers on this card so it would qualify for the Challenge (a D2D challenge blog) at Double Delights Challenges. To see the other Bloggers Challenge cards, HERE is the link. Happy Blog-versary in Creative Rumblings land!!! I have been so Blessed in the past year meeting and getting inspired by so many people on the internet! Plus, I have been really lucky and have won a TON of Blog candies- so I felt it would be fun to Pay it Forward! Now, I ran into a little issue I did not think about- people made a comment for the candy, and listed the sidebar posting all in one, and others posted a comment with the person that referred them as well…so instead of using random number generator, I had to write out all of the names, links and referrals and put them all in a bowl…….there are over 100-Wow! Thanks again for joining me for my party! Thanks again to everyone who joined in my celebration! It looks fairly new but my candy was posted there today- so wanted to pass it on. (Please scroll down for most recent post- this Blog-versary post will stay up here on top until 7/17 when the winners are announced). I am having 9 blog candies- since that is my favorite number (plus, I am a little OCD......)………. I will draw winners on July 17th at 7PM CST and you will have 48 hours to contact me to claim your prize. Thanks for following and sharing your creativity for the past year! Two red rubber sets from FCD (cause that is why I started blogging after all....) Leading Ladies and A Little Birdie Told Me and $10.00 gift certificate to use for anything in the Firecracker Designs by Pamela store (including digi images) from me. A collection of punches, a pair of scissors and a perforator set. I will also throw in some cardstock with cut out shapes from some of my Nestabilities dies (Nestabilities dies not included- just cut out shapes). Thanks for joining me in my Blog-versary celebration! Let the fun begin!!! (Oh- I have followers that are international papercrafters- I am happy to ship overseas as well). FCD Blog Hop- Sketch It! I cannot sketch anything….but, at FCD we do have a DT member that can sketch and she has introduced a new line of Digital Stamps- HERE is a link to the new digi’s by Boni Boutelle. (Pamela has added a new search capability- search by artist). One of the images-Ken- is available as a freebie HERE –grab him quick- there will be a new digi this weekend and he will be moved into the store! I colored the image with Copics E000 and E00, YG17 and SU markers for the hat. I used Wild Wasabi ink as an accent. For the layer behind the main image, I punched out tabs with the SU punch and cut them in 1/2, then layered them around the image. I decided for my accent piece to make a flower with the left over money background and the SU scallop punch. (I did not have any good DSP to use, so I Googled Money Background and printed one out to use). This is a circular Blog hop- keep going until you arrive back where you started (There are 11 stops in all). There is a surprise hostess to WIN free rubber of digi’s which Pamela will announce on HER BLOG on Monday. Leave a comment on each stop to be eligible to win! During the first week of each month, D2D (or Designed2Delight) offers a free digital image, and if you post a card to the blog, you get the next weeks digi free. I love a challenge and the cute images…so I had to make a card for the deadline is TODAY!!! This background was in my stash- it is a Technique Junkies background called Gesso Chic (jan 2007). I used Nestabilities dies and I sewed on some ribbon and added Dew Drops. I hope you can stop by again this weekend for the Firecracker Designe by Pamela Blog Hop! Blog-versary Giveaway drawing this Saturday! One Year Old- please stop by! This is one of my Favorite sentiment sets for Holiday sets and I love the snowflakes in it too! My husband always has freezing cold hands- ‘Cold Hands Warm Heart’ frequently passes my lips and I love having it in rubber! I also love the sentiments Give Thanks and Treasure Every Day that are awesome to use all year long. Karyn has a sample HERE and HERE is the Gallery at FCD to see samples done with the set- you do not need a coupon code at the check-out- the set is marked $4.49 until 11:59PM Wednesday 7/14. Have a great Wednesday- and please join us this Friday-Mon for a FCD blog hop. I joined an ATC group in June- and just attended the second meeting. Each meeting there is a swap with a theme, and a bouns ATC we make and pick blindly out of a brown bag. I used tissue paper for the background. I found a picture of Lucy and Ricky on the internet- I always loved watching I Love Lucy….. I used a Cuttlebug cutout for the red postage stamp background. I stamp and gold embossed a rose from Firecracker Designs by Pamela, and colored it in with Copics. I cut out the rose and tied gold organdy ribbon around the stem. It needed ‘something’…so I dragged the edges over the Versamark pad and gold embossed the edge . That is a napkin applied to a folded ATC (with Gel Medium) . I sewed on ribbon in a ‘rouched’ style, then gathered the left over piece at the edge and folded it in 1/2 to make a flower. Michelle’s card- we can choose to make any theme as well. I am enjoying trying new techniques like applying napkins to cardstock and folded ATC’s. There is a Themed ATC challenge Blog that I enjoy participating in- Fun with ATC’s- Challenge #13 theme is Flowers – so, I added the rose to this ATC so it would meet the theme- I think it is the perfect touch this ATC needed.